One of my food resolutions for 2013 is to minimize the amount of food waste that leaves my kitchen in the form of trash. That means coming up with new uses for kitchen scraps, especially what we think of as “inedible” or “aesthetically unappealing”. So much of what we throw out as trash is really food in another form. By being more mindful in the kitchen, we can do our part to help improve the environment, both locally and globally. If this sort of thing appeals to you, this New York Times article from July 2011 goes into more detail. When you’re paying Greenmarket prices for a bag of carrots or chard, it behooves you to use every part of your fruit and vegetable produce if you can. Carrot tops can serve as a substitute for parsley, in small quantities. Cauliflower leaves — when roasted — are to my palate, better than kale chips. Asparagus stalks can be turned into asparagus stock; this lends a subtle dimension to risotto and pasta. Ditto for corn cobs which when simmered in water, develop a faintly sweet corn stock that’s marvelous in vegetable soups, broth and consommé. Celery leaves are an integral part of a battuto; a future project that I have in mind uses dried celery leaves in homemade Old Bay seasoning. Besides being thrifty, this kind of exercise also helps stimulate creativity, which ultimately leads to discovery, self-education and empowerment. Cooking is as much a teaching and learning process, as it is about pleasure. While not every idea will work the first, second or tenth time you try it, at least you will have gained invaluable experience that you can use going forward. Failure is that which gives meaning to future success. This recipe is slightly more complicated than what usually appears on the blog. If you’d like to see future posts in a similar vein, please weigh in by commenting below. Note: This recipe is scaled to serve two people, and is partly adapted from this post at Food52.com. 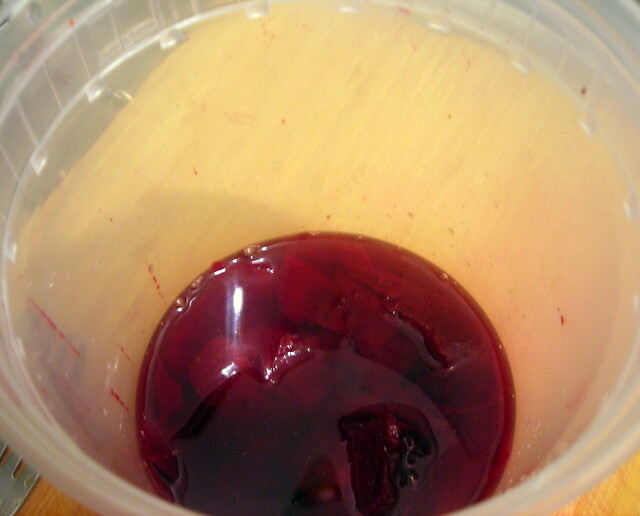 In addition, the beet vinegar requires an advance prep time of a minimum of one week. Heat 2″ of oil in a deep saucepan, wok, or deep skillet to 325 degrees. While the oil is heating combine the flour, cayenne, salt and pepper in a medium bowl. Toss the oysters in the flour mixture. When the oil reaches 325 F, fry half the oysters until golden — about 4 minutes. 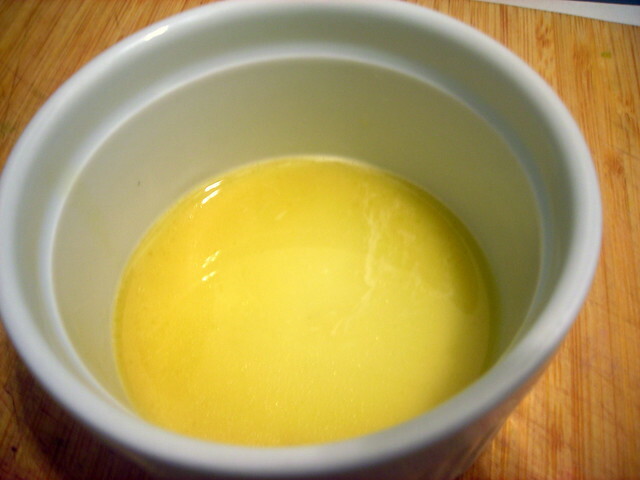 Remove from oil and place on a paper-towel lined plate to drain. Let the oil return to 325 F and fry the remainder of the oysters. Sprinkle oysters with salt and a few grinds of pepper. At this point, the vinegar is ready for use. You can choose to let the beets continue steeping or strain the liquid. Cara Cara oranges are a variety of blood orange, notable for their sweetness. If you’re unable to obtain them, substitute regular oranges instead. 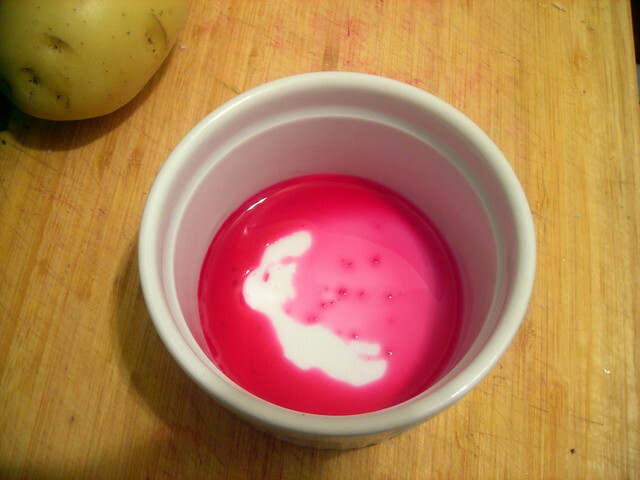 In a small bowl or ramekin, whisk together the beet vinegar, orange reduction and extra-virgin olive oil. Taste for salt and pepper. Combine all ingredients in a large salad bowl. Gently toss the salad together. Taste for salt and pepper. Mound a serving portion of the salad at one edge of a large salad plate. Spoon the oysters at the other end of the plate. 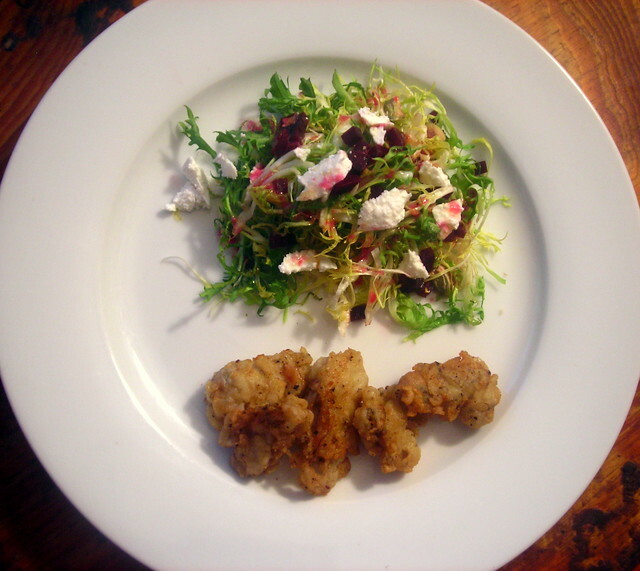 Drizzle the salad with the beet vinaigrette. Serve at once. Time: About 30 minutes, not including prep time for the beet vinegar. 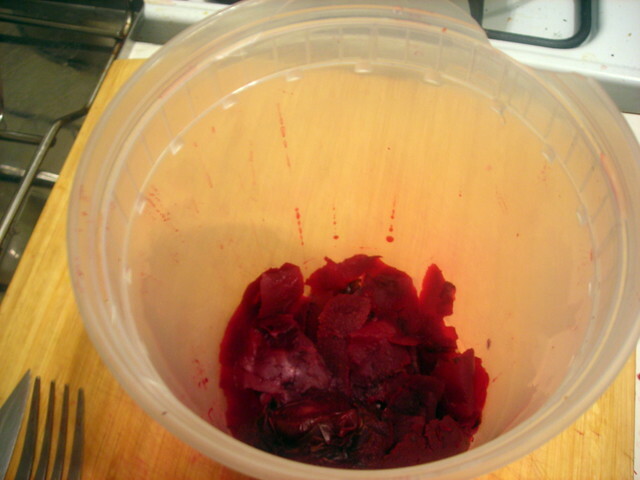 The beets can be cooked in advance. 07 Mar	This entry was published on March 7, 2013 at 5:32 am. It’s filed under American cuisine, food, food photography, recipe, winter and tagged American cuisine, beets, food photography, oysters, salad, winter. Bookmark the permalink. Follow any comments here with the RSS feed for this post. In case folks are curious, the beet vinegar is there mostly for color. I wanted to see if I could impart some of beets’ natural sweetness to vinegar. I wasn’t successful in that regard, hence the presence of the Cara Cara OJ. The next time I do this, I’m probably going to dramatically increase the ratio of peels to vinegar. I’m thinking 1 cup peels and trimmings to 1/4 cup vinegar sounds about right. On the other hand, the color’s fantastic. I could easily see using it in things that normally call for raspberry vinegar. I’d have to introduce some element of sweetness to take the edge off, however.